For weeks now the excited buzz of London Fashion Week has filled our worlds with tweets, facebook statuses and blog updates. Each day we see the same image with a different dress from a different designer – but what happens backstage behind the beauty? With 65 catwalk shows and 45 salon shows and presentations taking place over a period of six days, the number of people needed to make the magic happen on the other side of the catwalk is large. Designers, assistants, stylists and hair and makeup teams are just a few examples of the sorts of people who’re needed to put together a single show, and let’s not forget all of those dedicated, unpaid interns. Why are there so few articles about all of the hard work that goes on behind the flawless fashion we see on the catwalk? What is fashion hiding? Amanda Betts is a 21-year-old fashion student and employee of the popular brand FCUK from Southampton who was lucky enough to intern with PPQ this season. Along with the other interns working for PPQ, she tells me that there were 12 in total assisting in the studio prior to the show, Amanda was one of the lucky few who got to see the collection transform beautifully from a caterpillar into a butterfly. But does this take the fun out of fashion? Is the surprise factor of a collection you’ve never seen before more exhilarating than seeing one you helped to prepare? Or is the experience of creation and preparation just too inspiring to miss? 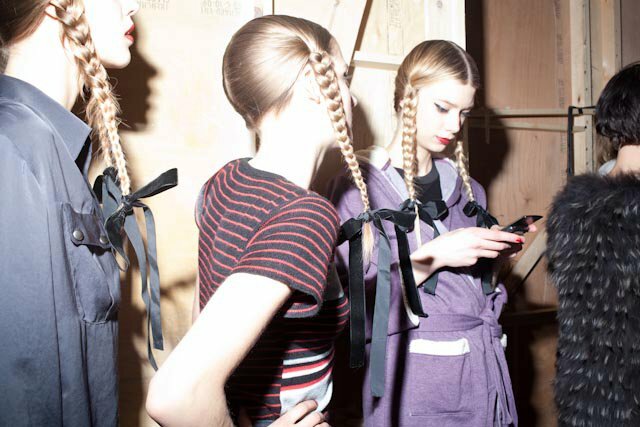 Laura, like Amanda worked backstage for PPQ on the night of the show and also worked backstage at the Mark Fast show. 21-year-old student, Zoe Whitfield from Southampton however thinks the opposite of Laura, saying that although backstage is a more thrilling experience; she prefers to sit and watch the show. So what actually happens backstage? On the side of the catwalk the models are composed, the clothes are glamorous and everything is, well, perfect. But is that always the case? Is fashion 24 hours a day of glitz and glamour or does it loose its flawless charm behind closed doors when nobody’s watching? “There is a lot of hard work and chaos involved in creating that beautifully, flawless image”, shares Laura. “The models have about ten seconds to switch looks during a change so there are usually two dressers per model, which is what I was doing backstage." So maybe it’s all down to personal preference and the experience that you as an individual have at fashion week. Maybe fashion week is like Marmite; you either love it or hate it? Some may enjoy getting their hands dirty backstage whereas others may prefer sitting in the front row with a notepad and a camera. Some probably like to avoid the chaos and hassle all together and simply watch live streams of the shows at home on their laptops, drinking tea and wearing slippers. Glamorous or not, backstage at London Fashion Week is fascinating and we can only hope to receive more tweets and blog posts about ‘the other side’ of the catwalk in the future.